It could be when December hits, or at the first sign of snow, or even before then — whenever it is that you choose to deck your halls, getting creative with your holiday décor is a true labor of love. Your home is a gathering place for friends and family to enjoy each other’s company, to make memories and to get cozy over the holiday season. You want to make sure your home is a warm and inviting place for loved ones to gather, but most of all, a place where everyone can feel excited and enthused by the joy the season of giving brings. But, the holidays are a busy time of year! Finding easy ways to spruce up your home with holiday trimmings can be challenging. However hectic the holiday season can get, decorating your home should be fun, fanciful and a stress-free task! So, turn on your holiday music and get inspired to make your home merry without the hassle by using these stylish yet simple decorating tips! Earthy and casual, yet stylish. Drawing the outdoors in is a sure way to elegantly decorate your home for any season. Nature-inspired décor is ideal for decorators looking for understated charm. Creatures of the forest, wooden accents and pretty pine cones are unfussy ways of bringing holiday ambiance into your home. Place items with sprigs of greenery, wild cranberries and hints of birch on tabletops and shelves to create rustic warmth and texture. Our reindeer, candle votive, and lac mason hurricane and decorative accents will make any home a convivial Christmas cottage. Adding elements of lighting can add festive notes all over your home without being overly ornamental. Tapered and votive candles will help you cast the perfect glow on this holiday season. Classic centerpieces for a holiday meal, or add jovial candlelight to every corner of your dwelling. Find an empty end table, window sill or use your mantel to arrange groupings of three to four candles in an alternating fashion. Note that something with frosted-glass will provide a soft flickering glow that will brighten your home with joy all season long. Our gingerbread votive, small winter scene hurricane, and light festival candle holders will fill your home with festive flickering. The official pattern of the holiday season, our ideas for plaid will have you singing carols! Plaid is the perfect way to bring Christmas cheer to a rustic country styled home. Nothing says holiday cheer like hot cocoa and cookies on display with our tartan “fa la la la la” dish collection. Don’t worry about set up time when you have yourself a set of plaid pillows and throw, just place them in the corners of your sofa or simply add them to the pillows already on your bed — drape your throw over a chair or fold it at the end of your bed to add festive flare anywhere. Create a cozy corner for hot cocoa and holiday movies, writing Christmas cards or gift wrapping with our checkered throw and pillows. If your home has more of a minimalist mood; red and green décor may not be in your holiday décor day dreams. Gold, silver and bronze radiate charm and can be a perfect way to dazzle your home for the holidays. It may not be the standard pallet for the season yet it is equally festive. Warm metallics create a classic modern look while adding some glitz and glam perfect for a celebratory contemporary home. White décor can transform your home in to a beautiful wintery scene ideal for the season. You don’t have to coat your home from top to bottom in red and green to do justice to the most wonderful time of the year. Items like our Rudolf’s sleigh, winter scene hurricane and our snowflake candle holder will light up your home with Christmas cheer without all the bright hues. What could be easier than breezing through your home hanging on knobs, hooks and switches. 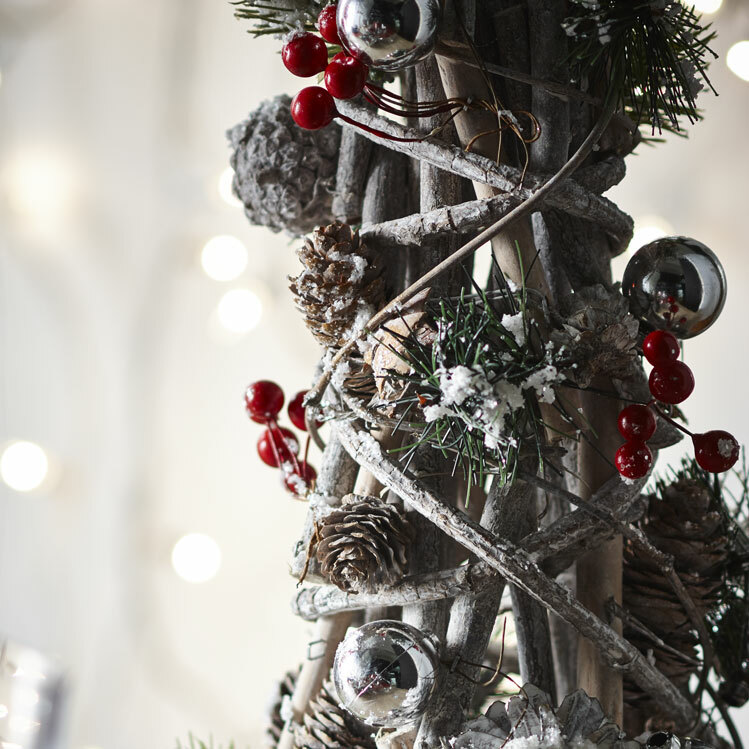 Hanging décor can bring a playful decorative touch and is the most unfussy way to deck the halls. The decorative opportunities are endless with hanging décor. Add holiday notes to rooms that are harder to decorate, such as the bathroom or kitchen by hanging festive bits and pieces on the door or cabinet knobs. If you’re lacking by way of hooks, our snowman hook (in-store only) is great to place on your mantle or on a cabinet to hang a stocking or for adding extra notes of festive flare! Try hanging from your chandelier over your holiday table for an alternative take on a centerpiece! The gingerbread door knob décor and Christmas cottage décor ball will add whimsical touches and enhance the holiday theme of your home.